Eating healthy can be a challenge. And cooking when it's hot outside? No one wants to do that. But this recipe solves both problems. Made with low carb, low calorie shirataki noodles, it contains only 185 calories, 26 grams of carbs, and 4 Weight Watcher Points+ per serving. Since shirataki noodles are precooked, you'll spend even less time in the kitchen. Just drain, rinse well, and pat the noodles dry with paper towel. You can prep the rest of the ingredients and mix the whole recipe in less than 10 minutes. Refrigerate the salad for about an hour to allow the flavors to blend, and you're good to go! Don't believe it's that easy? Watch our Chef Tommy make the salad below. In a large bowl, add noodles, carrots, snow peas, red bell pepper, and baby corn. Whisk soy sauce, oil, sugar, and garlic powder in a bowl until well combined OR use 1/3 cup of ready-to-use dressing. Pour dressing over noodle salad; toss gently. Cover and refrigerate 1 hour before serving. Visit us at www.getskinnynoodles.com to learn more about shirataki noodles, get cooking tips, and explore all of our shirataki noodles recipes. 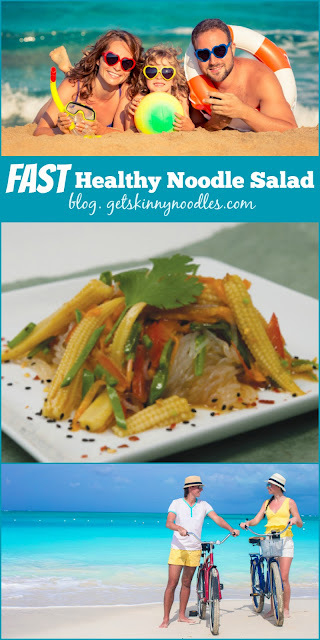 Want to try an assortment of Skinny Noodles varieties? Check out the options here.